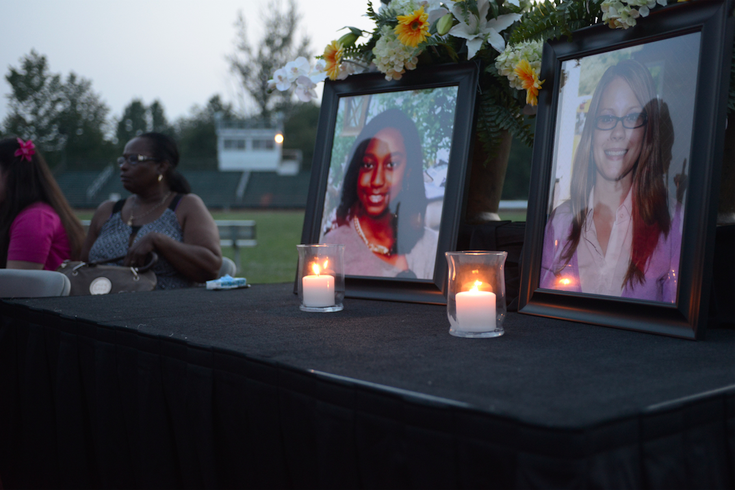 Family, friends, students, district employees and residents gather at a vigil to honor the lives of Janiya Castleberry and Allison McGinnis, at Helen Fort/Newcomb Middle School in Pemberton, NJ, on Thursday September 3, 2015. Janiya Castleberry and Allison McGinnis, a joyful student and her beloved teacher, were remembered Thursday night for their bond by teachers, faculty, family and friends at the Helen Fort/Newcomb Middle School in Pemberton, where McGinnis taught and Castleberry was a rising eighth-grader. 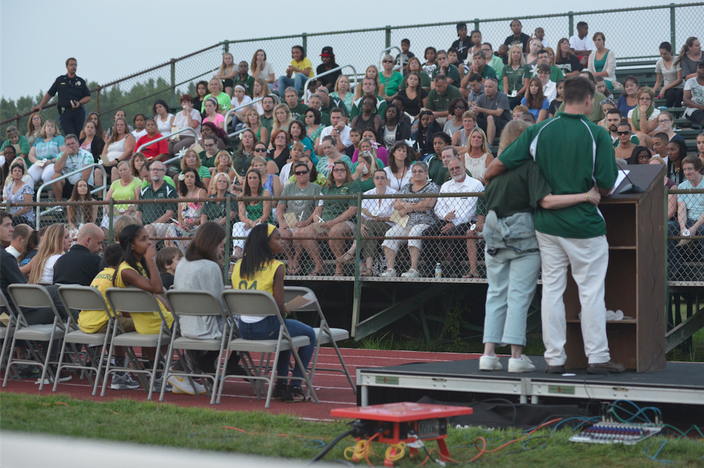 Tony Trongone, superintendent of the Pemberton Township School District, talked about the tragedy before 200 gathered for a vigil to remember Janiya and McGinnis, and rally Pemberton as a community. "We are celebrating their life and legacy," Trongone said. "We are shining a light on the darkest time." Castleberry, 13, died Aug. 20 following a car accident earlier in the month in Southampton, Burlington County. McGinnis, who went to her student’s funeral along with a host of teachers, died in Southampton on Aug. 27 while running along Route 206 in preparation for a foot race in Hawaii. After Janiya's accident, Trongone said, teachers visited her at Cooper University Hospital for three weeks. "Allie was the first teacher to visit Janiya," he said. At first they believed Janiya might recover, then her condition slipped, Trongone said. A week after the student's death, Trongone said he was attending a board meeting when he learned of the Route 206 accident, and that it might be McGinnis. The teacher's death was confirmed about five hours after the accident. "My heart sank," he said. Knowing of the close relationship McGinnis had with Janiya, Trongone said he was"concerned for our teachers" at the middle school. "We lost a student. And now a teacher," Trongone said. "Words cannot express." He said Janiya often "popped into Allison's class for a hug. Or a smile." 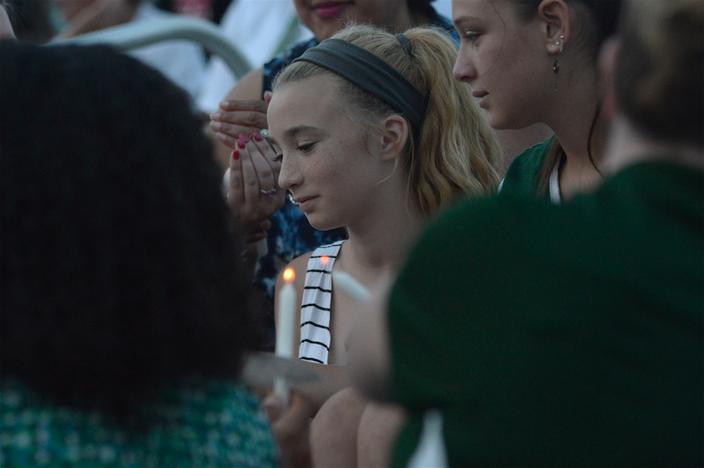 After the vigil, which ended with a candle lighting ceremony, the singing of "Amazing Grace" and a moment of silence, one of Janiya's classmates remembered her friend. Jaedda Butler, who had known Janiya since second grade, visited her at the hospital twice. Jaedda found out about her death in an online group chat. With tears streaming down her face, she recalled they had planned a big opening day handshake to start school. "She was the other half of me," Jaedda said. Allie was one of her favorite teachers, she added. She and other students wore T-shirts made by the teacher for the school's annual field day. Trangone said the middle school may have an assembly, after there is time to grieve. Funeral services for McGinnis were held Wednesday at Vincentown United Methodist Church. McGinnis was hit by a pickup truck driven by Patrick Miller, 28, of New Hanover. David Eldridge, 31, of Wrightstown, was a passenger. Eldridge died in the incident and Miller was transported to a trauma center with severe injuries. The incident is under investigation.